Welcome to Xojo, an integrated software developer tool and programming language that is the easiest way to make desktop, web and iOS apps. With Xojo you can create desktop apps for Windows, Mac and Linux (including Raspberry Pi), web apps for all popular web browsers and iOS apps for iPhones, iPads and other iOS devices. 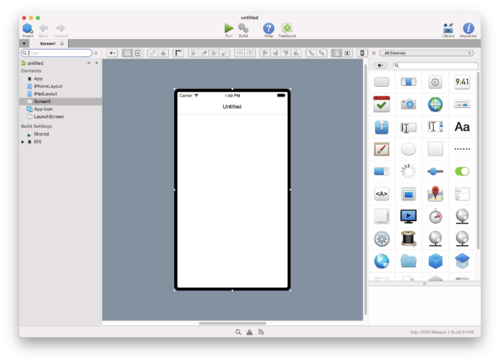 Xojo is a rapid application development (RAD) tool with a user interface (UI) builder that lets you create your app's user interface with little to no programming required. If you know how to drag and drop, you can build the UI using the wide variety of built-in controls, making it easy to create powerful, multi-platform desktop, web and iOS applications faster than you ever thought possible. If you are new to programming, you will find Xojo’s object-oriented programming language easy to learn. If you are an experienced programmer, you will find the language to be powerful and robust. In either case, you will find you can accomplish quite a bit in a short amount of time. One way Xojo makes app development faster and easier than traditional tools is by removing the need to learn how to use the complex Application Programming Interface (API) for the operating system. Instead, you use the Xojo Programming Language and Framework which provides a simpler and faster way to create your apps. Xojo doesn't force you to use a specific OS. Are you a Mac developer that wants to create Windows apps? You can do that with Xojo right from your Mac. Do you use Windows, but want to create Mac apps? You can do that from within Windows. In fact, you can develop using Xojo on Windows, Mac or Linux to create apps that work on Windows, Mac, Linux or web (iOS app development does require a Mac, however). Xojo is an integrated tool, but it is also a programming language for Windows, Mac, Linux, iOS, web and Raspberry Pi. Xojo builds on languages such as Visual Basic and Java to provide the fastest and easiest way for you to create the apps you need for the platforms you use. Xojo uses safe programming patterns (strong data typing, for example), is object-oriented and has modern programming features such as introspection, extension methods and delegates. Programming with Xojo is fast, easy and most importantly, fun! Although maybe you haven't heard of it before, Xojo has been around for many years. Since 1998, in fact. Xojo was originally called REALbasic, then eventually Real Studio, but the programming language remains largely the same. Xojo was one of the first languages to use Automatic Reference Counting (ARC), something that other languages such as Swift and Objective-C now use. Although Xojo is easy to learn and use, it also has advanced features such as namespaces, extension methods, exception handling, introspection, delegates and more. And Xojo is always being modernized. For 64-bit apps (and Raspberry Pi), Xojo uses the LLVM compiler tools to compile your apps for the best possible performance. LLVM are the same compiler tools used by Apple with Swift and Objective-C. A new Xojo framework is being made available, which uses a more modern design, standardizes API calls and takes advantage of new technologies. Xojo is ready for the future and the next 20 years of software development. Xojo feels familiar to programmers who have used other languages such as Visual Basic, Java and C# because it uses a similar object-oriented programming model, with similar data types and constructs. Using Xojo, you'll be able to create apps even faster than you ever thought possible. Xojo is also friendly to new programmers. A big problem with most programming languages is that they are overcomplicated and overwhelm those new to them. Xojo has a powerful, integrated code editor with auto-complete that makes it easy to learn the language. The Xojo IDE is also incredibly easy to use, making experimentation (one of the best ways to learn) fast and fun. Xojo is a great programming language for creating all types of apps, from simple "hello, world" to powerful enterprise software. With Xojo you'll create your apps in less time than before at less cost, making it a great investment for you or your company. It is a wonderful way to create apps for Windows, Mac, Linux, iOS, web and Raspberry Pi and continues to evolve with new features and capabilities added on a regular basis (quarterly, in fact). Our goals with Xojo have always been to make programming simpler. We can't wait to see what you create with it! You can download Xojo for your operating system (Windows, Mac or Linux) from the Xojo Download page. You'll have to first create an account (your Xojo ID), but after that Xojo is free to use. You can purchase a license when you are ready to create stand-alone apps. Xojo works on all current operation systems. For more specifics, you can review the Xojo System Requirements. After the download has completed, you can run the installer (or copy the files) for your OS. Once the installation is finished (it only takes a minute or so), you can start Xojo to begin creating your first app. After starting Xojo, the Project Chooser window appears. In order for you to quickly dive right into Xojo, follow these steps to create your first (admittedly simple) desktop app. In the Project Chooser, choose "Desktop" and fill in the App Name as "MyFirstApp" and click OK. This displays the IDE (or Integrated Development Environment) with the Workspace for the project. This is where you work on your Xojo projects, creating UI layouts and writing code. Don't worry about everything that you see there, it will be covered later in the User Guide. Now, drag a Button from the Control Library on the right onto the Window layout in the center. You can position the button anywhere you like within the window. With the button selected, press Return to change its caption to "Click Me". Double-click the button on the layout to add an Event Handler. This is where you'll put a single line of code to display a message when the button is clicked. After double-clicking the button, the Add Event Handler window appears. Select Action and click OK to add the Action event handler. This event handler is called when the button is clicked. Click the Run button on the toolbar to run your app. Click the button to display the message. That's it. You've now created an app. Although Xojo makes it easy to create simple apps, it can also create much larger and more powerful apps just as easily. In fact, Xojo is actually written in Xojo! This page was last edited on 25 February 2019, at 16:32.